It was a Monday and as usual it was a bad Monday but it wasn’t bad just because it was the start of the school week- on this special day there was a fight. It started during Irish class. Jerry started making fun of Tom but Tom was sick of it so at break time Tom started throwing punches. Of course we were a class boys and nobody was helping Tom nor Jerry – we all just gathered around and started chanting fight , fight , fight. After 2 minutes of them fighting still no teacher came so I decided to break it up because Jerry looked like he had a broken nose and Tom had a big bruise on his chin. I told my friend to hold Tom and I’d hold Jerry so my friend went behind Tom and caught his two wrists and got him to the ground. I did the same but when I was trying to get him down he tripped me, twisted around and punched me in the ribs as I was falling. As I got up I think Jerry saw the look in my eye because he started saying sorry really quickly but I was so cross that I gave him a bruise on the chin. I am not a fan of fighting even though I am a big guy.Marcus T.
hi, I really liked your piece. i liked that it had a lot of action, i always skip a few chapters if it is too boring. the only thing is you had too many words and i don’t get where the teacher is, otherwise it would be a winner! I love your story very entertaining! Good story but you could have added a little more detail.I know that is hard because it can only be 100 words but overall I really enjoyed this story. Wow, Jack! Your story was very intense and suspenseful. 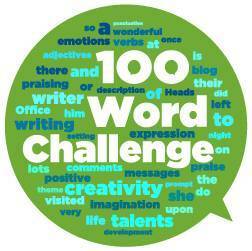 I would like to point out, though, that you 100-word challenge is 209 words long.